With the support of general manager Anders Tylman-Mikiewicz and director of the user experience team Jonas Söderqvist, Media M8 created a short video project for the Volvo Monitoring and Concept Center in California. The project illustrates the development of a state-of-the-art system that has found its inspiration in comments of Volvo drivers contributing their experiences to make the development of future technology even more focused on user experience. Media M8 took the work of developer Erik Stenborg and translated it into a stunning display of Volvo’s driving experience and leadership role in the luxury car market. On a very tight schedule, Media M8 produced driving shots of high production value and great variety that allowed for a compelling and effective display of the new technology while clearly addressing and illustrating the comments Volvo drivers had expressed. 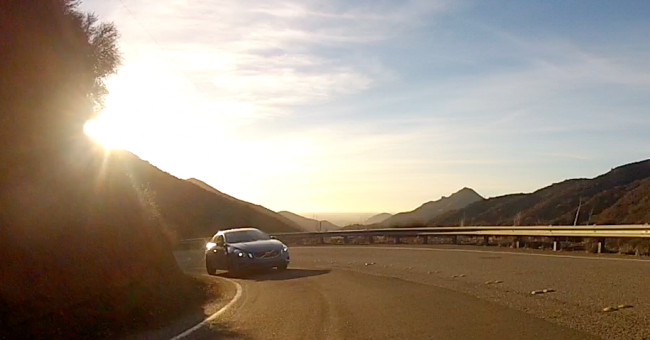 In a collaborative process, Volvo and Media M8 established the goals for the video project and found a location that best represented the driving situation addressed by the technology development just outside of Camarillo, CA in Ventura County. A script and shot list defined not only the general parameters of the project, but also specified important details that expressed the goals of the project. Some of the project was going to involve elaborate effect shots that required an early involvement of the motion graphics designer during the pre-production process. During production, effective placement of small cameras in relevant spots on the outside and inside of the car, as well as compelling interview footage, showed the various aspects of the idea in breathtaking detail. Due to the early involvement of the post-production department, the project could be finished in record time, such that even different versions were assembled to reflect and address the varied background knowledge of different audiences. For this project, Volvo supplied a beautiful S60 model in one of their new concept colors. The internal release of the project was timed around the LA Auto Show, where a similar vehicle with the same color was prominently displayed. View images of the new Volvo in this blog post of Motor Authority. If you’re looking to use video as a way to present your work to colleagues or at trade shows, or would like to consult with us about your project idea before committing to a media production company, talk to us. We’d be glad to assist you – no strings attached.